Fully updated, revised, and expanded, the new edition of Legal and Ethical Issues in Nursing reflects current and emerging influences of the law, legal issues, and ethical issues on nursing practice. It addresses the expanding autonomous roles of nurses at all levels of education and licensure, and in all settings. It also reflects innovative health care delivery models, as well as new federal and state laws, including the ACA. This edition’s new ethical scenarios more realistically integrate ethics with personal legal accountability, and encourage deeper reflection on connections between law and ethics. Popular features from previous editions are retained, including chapter previews, objectives, key terms, application exercises, guidelines, chapter summaries, and “You Be the Judge” features at the end of each chapter. 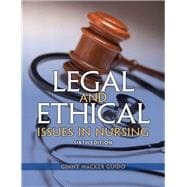 Ginny Wacker Guido has been active in legal and ethical issues in nursing for the past 30 years. She developed an interest in this area of nursing when teaching undergraduate nursing students in Houston, Texas, and this excitement for further knowledge and understanding of this content area encouraged her to pursue a doctor of jurisprudence degree. Over the years, she has attended multiple workshops and conferences, updating and expanding her knowledge base regarding both the legal and ethical aspects of nursing practice. Dr Guido also continues to publish and present on legal and ethical issues with special emphasis in a variety of clinical practice settings. She remains active in nursing education and is currently employed as the Regional Director for Nursing and Assistant Dean, College of Nursing, Washington State University Vancouver.